Many advanced technologies, such as direct energy production through solar cells, chemical processing by catalysis, and nanofabrication using self-assembled systems are currently limited by the properties and behavior of interfaces. Many of these boundaries involve thin films or "buried" surfaces. It's possible to gather information about chemical and molecular identities, as well as material geometry and bonding configurations at these very thin regions by exploiting special techniques involving light. We are using spectroscopic ellipsometry, infrared polarization modulation spectroscopy, and Raman scattering to study interfaces in a range of problems. 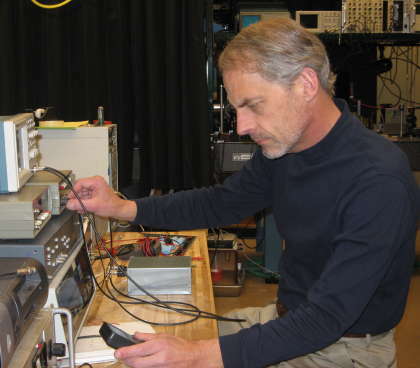 Most of the projects involve collaborations with other members of the faculty at Mines and at the University of Colorado, as well as with scientists at the National Renewable Energy Laboratory (NREL) and at ITN Energy Systems, Inc. All of the research is strongly interdisciplinary, drawing from condensed matter physics, chemistry, and materials science. I am interested in developing teaching strategies that exploit current insights about how people learn. My teaching philosophy is centered on active-engagement methods that rely on negotiated understanding through social interactions among students. "Size-Dependent Exciton Formation Dynamics in Colloidal Silicon Quantum Dots", Bergren, M. R., Palomaki, P. K. B., Neale, N. R., Furtak, T. E., and Beard, M. C., ACS Nano 10, 2316-2323 (2016). "Nickel Oxide Interlayer Films from Nickel Formate-Ethylenediamine Precursor: Influence of Annealing on Thin Film Properties and Photovoltaic Device Performance", Steirer, K. X., Richards, R. E., Sigdel, A. K., Garcia, A., Ndione, P. F., Hammond, S., Baker, D., Ratcliff, E. L., Curtis, C., Furtak, T. E., Ginley, D. S., Olson, D. C., Armstrong, N. R., and Berry, J. J. , Journal of Materials Chemistry A 3, 10949-10958 (2015). "Ultrafast Electrical Measurements of Isolated Silicon Nanowires and Nanocrystals", Bergren, M. R., Kendrick, C. E., Neale, N. R., Redwing, J. M., Collins, R. T., Furtak, T. E., and Beard, M. C., Journal of Physical Chemistry Letters 5, 2050-2057 (2014). "Conjugated Phosphonic Acid Modified Zinc Oxide Electron Transport Layers for Improved Performance in Organic Solar Cells", Braid, J. L., Koldemir, U., Sellinger, A., Collins, R. T., Furtak, T. E., and Olson, D. C., ACS Applied Materials and Interfaces 6, 19229-19234 (2014). "Etch-Resistant Zn(1-x)MgxO Alloys: An Alternative to ZnO for Carboxylic Acid Surface Modification", Brenner, T. M., Flores, T. A., Ndione, P. F., Meinig, E. P., Chen, G., Olson, D. C., Furtak, T. E., and Collins, R. T. , Journal of Physical Chemistry C 118, 12599-12607 (2014). Cu[In(1-x)Gax]Se2 Thin Films", Li, J., Contreras, M., Scharf, J., Young, M., Furtak, T. E., Noufi, R., and Levi, D., Photovoltaic Specialists Conference (PVSC), 2013 39th IEEE , 2609-2611 (2013). "Efficient Photoelectrochemical Water Oxidation over Cobalt-Phosphate (Co-Pi) Catalyst Modified BiVO4/1D-WO3 Heterojunction Electrodes", Pilli, S. K., Janarthanan, R., Deutsch, T. G., Furtak, T. E., Brown, L. D., Turner, J. A., and Herring, A. M., Physical Chemistry Chemical Physics 15, 14723-14728 (2013). "Electrical, Optical and Structural Properties of Al-Doped ZnO Thin Films Grown on GaAs(111)B Substrates by Pulsed Laser Deposition", Weigand, C., Crisp, R., Ladam, C., Furtak, T., Collins, R., Grepstad, J., and Weman, H., Thin Solid Films 545, 124-129 (2013). "Electron Transfer in Hydrogenated Nanocrystalline Silicon Observed by Time-Resolved Terahertz Spectroscopy", Bergren, M. R., Simonds, B. J., Yan, B., Yue, G., Ahrenkiel, R., Furtak, T. E., Collins, R. T., Taylor, P. C., and Beard, M. C., Physical Review B 87, 081301 (2013). "Athermal Photofluidization of Glasses", Fang, G. J., Maclennan, J. E., Yi, Y., Glaser, M. A., Farrow, M., Korblova, E., Walba, D. M., Furtak, T. E., and Clark, N. A., Nature Communications 4, 1521-1531 (2013). "BiVO4/CuWO4 Heterojunction Photoanodes for Efficient Solar Driven Water Oxidation", Pilli, S. K., Deutsch, T. G., Furtak, T. E., Brown, L. D., Turner, J. A., and Herring, A. M., Physical Chemistry Chemical Physics 15, 3273-3278 (2013). "Alkyl Surface Treatments of Planar Zinc Oxide in Hybrid Organic/Inorganic Solar Cells", Allen, C. G., Baker, D. J., Brenner, T. M., Weigand, C. C., Albin, J. M., Steirer, K. X., Olson, D. C., Ladam, C., Ginley, D. S., Collins, R. T., and Furtak, T. E., Journal of Physical Chemistry C 116, 8872-8880 (2012). "Spiral Plasmonic Nanoantennas as Circular Polarization Transmission Filters", Bachman, K. A., Peltzer, J. J., Flammer, P. D., Furtak, T. E., Collins, R. T., and Hollingsworth, R. E., Optics Express 20, 1308-1319 (2012). "Plasmonic Band-Pass Microfilters for LWIR Absorption Spectroscopy", Banks, J. M., Flammer, P. D., Furtak, T. E., Hollingsworth, R. E., and Collins, R. T., International Journal of Optics 2012, 916482 (2012). "Optical Properties of Zn(O,S) Thin Films Deposited by RF Sputtering, Atomic Layer Deposition, and Chemical Bath Deposition" Li, J., Glynn, S., Christensen, S., Mann, J., To, B., Ramanathan, K., Noufi, R., Furtak, T. E., and Levi, D., Photovoltaic Specialists Conference (PVSC), 2012 38th IEEE, 1580-1583 (2012). "Light Induced Water Oxidation on Cobalt-Phosphate (Co-Pi) Catalyst Modified Semi-Transparent, Porous SiO2-BiVO4 Electrodes" Pilli, S. K., Deutsch, T. G., Furtak, T. E., Turner, J. A., Brown, L. D., and Herring,, Physical Chemistry Chemical Physics 14, 7032-7039 (2012). "Ultra-High Extinction Ratio Micropolarizers Using Plasmonic Lenses" Peltzer, J. J., Flammer, P. D., and Furtak, T. E., Collins, R. T., Hollingsworth, R. E. , Optics Express 19, 18072-18079 (2011). "Cobalt-Phosphate (Co-Pi) Catalyst Modified Mo-Doped BiVO4 Photoelectrodes for Solar Water Oxidation" Pilli, S. K., Furtak, T. E., Brown, L. D., Deutsch, T. G., Turner, J. A., and Herring, A. M., Energy & Environmental Science 4, 5028-5034 (2011).